Have you ever wanted to have a nice chill inside of a castle with your friends? Yeah, us too. We haven’t exactly accomplished it, but we’ve gotten close. The Griffin in Downtown Las Vegas meets that deep-down castle need within every princess and knight. A hipster hotspot on the weekends, The Griffin is the place to be. 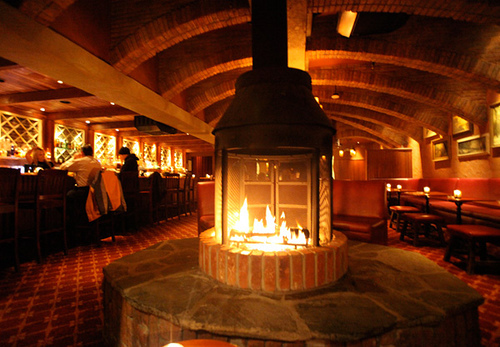 Dark leather booths and fireplace pits on either side of the bar will have you feeling utterly royal. If you’re looking to meet some interesting (often attractive) people and have conversations about indie music and independent films, head on over to The Griffin and have a pint. The second you walk into The Griffin, you’ll find yourself craving an Old Fashioned. It just feels right. A smooth cocktail by the fire? Yes, please! The bartenders at the Griffin have skills that go beyond vodka cranberry cocktails. Order the drink you really see yourself enjoying in a castle with confidence. They won’t screw it up. The drink selection ranges from unique craft beers and signature cocktails to the unforgotten, tried-and-true. Their happy hour is outstanding! You enjoy a can of Hamms for just one dollar and a well cocktail for three. Happy hour runs from 10–11p.m., which makes this cozy bar the perfect place to start your night. If you just can’t decide what to order, the bar staff is very knowledgeable and can recommend something great. Enjoy the music from their killer rock and roll jukebox out front or venture to the back room for a completely different feel. On the weekends, the back room doubles as a dance floor to the sounds of a DJ spinning or sometimes even a live band. As you pass into the back room, you’ll instantly feel like you’re privy to a local secret. The Griffin will quickly become a regular go-to DTLV bar. Downtown Las Vegas is home to many bars and restaurants and the best way to experience it all is on a Vegas Pub Crawl. Check our availability, and book a pub crawl for you and your 14 closest friends now. Our Midnight Madness tours are the best way to get WILD once Downtown really lights up!